“Abra Kadabra” teased us and teased us with the potential answer to this question, so much so that everything else in the episode seemed secondary. Gypsy and Cisco’s long distance relationship hit a rough patch as her need to avenge her ex-partner/boyfriend put her at odds with Team Flash. Joe sank into despair over his inability to do anything to save his daughter. Barry again had his moral code tested, and chose not to do the more Oliver Queen-like thing. Instead of negotiating with a killer to potentially save Iris, as he was about to in this episode, he has decided to run further into the future to collect the answers he needs about Savitar. Plus, Caitlin flat out died and was reborn as Killer Frost. Okay. Actually, the mystery about Savitar doesn’t completely overshadow that last part because a character dying and immediately coming back evil is a pretty big twist. Except it’s not. Caitlin’s inevitable turn into Killer Frost has been hanging over the majority of the season. 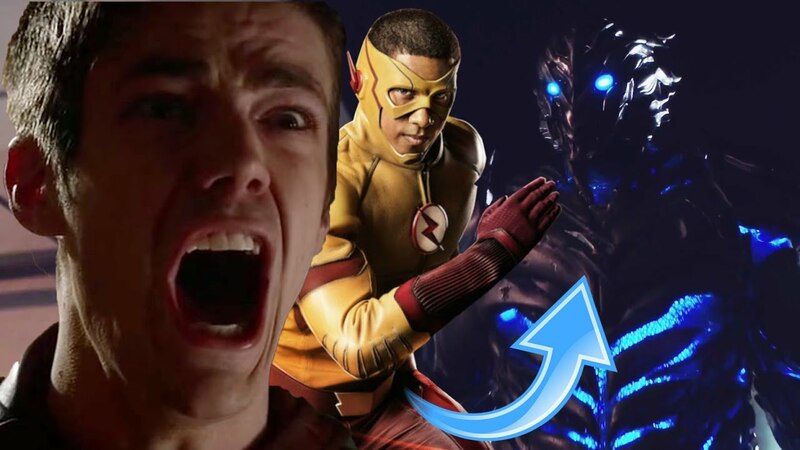 It even predates the “save Iris from Savitar” arc, but Barry’s little trip to the future established Killer Frost as being one of the things they needed to stop from happening. They have now failed, and the ramifications of that failure, via Julian violating Caitlin’s dying wishes by removing her necklace and allowing her meta powers to heal our mortal wound, will be largely felt in the coming episodes. H.R., who was mysteriously absent this episode until an awkward comedy bit at the end? Wally, who was similarly a non-entity this episode? A future version of Barry? If they simply go about this as normal, Savitar will turn out to be one of this season’s new characters, such as H.R., Julian or Joe’s girlfriend, and Gustin’s comments are exaggerated to throw us off the scent. However, if it really is going to be so shocking then anything’s possible. Maybe it’ll be the real Jay Garrick. Yeah, let’s go with that. It makes no sense, but it seems like the writers will have to jump through several hoops to explain whoever it turns out to be. 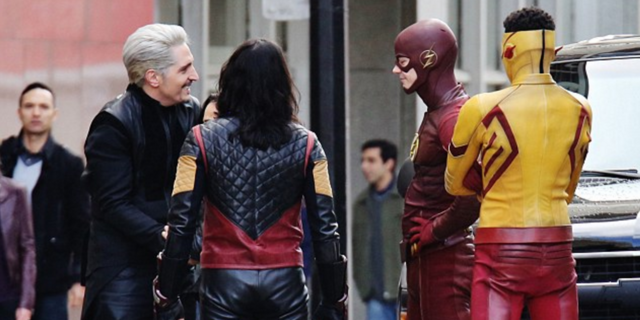 Can we at least agree that future Barry’s hair/wig looks terrible? That’s probably supposed to be the point, but does it have to look so much like Tobey Maguire during the emo part of Spider-Man 3? Ray, Jackson and Stein all work at STAR Labs, the former as a janitor, the latter two as an overbearing boss-meek employee duo. 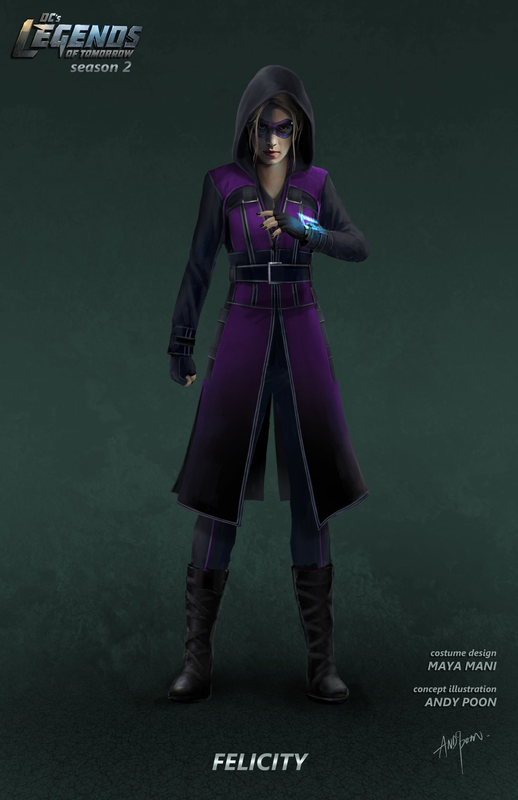 Sara and Amara make for a killer henchwoman combo for now-Mayor Darkh in Star City, where the entirety of Team Arrow, including a costumed Felicity Smoak and even The Flash, have been killed off. Rip is trapped on a severely damaged Wavewider, cut off from the outside world and driven a little mad by the isolation. On the plus side, his cake decorating skills are coming along nicely. But that little joke Nate slips in while the rest of the team looks super sad about Amara is the perfect example of what Klemmer said about aiming for life or death stakes while also maintaining a sense of humor about it. In reality, Legends is such a fluffy show (and death such an impermanent thing in the Flarrowverse) that Amara’s demise-by-freeze-ray barely registers. 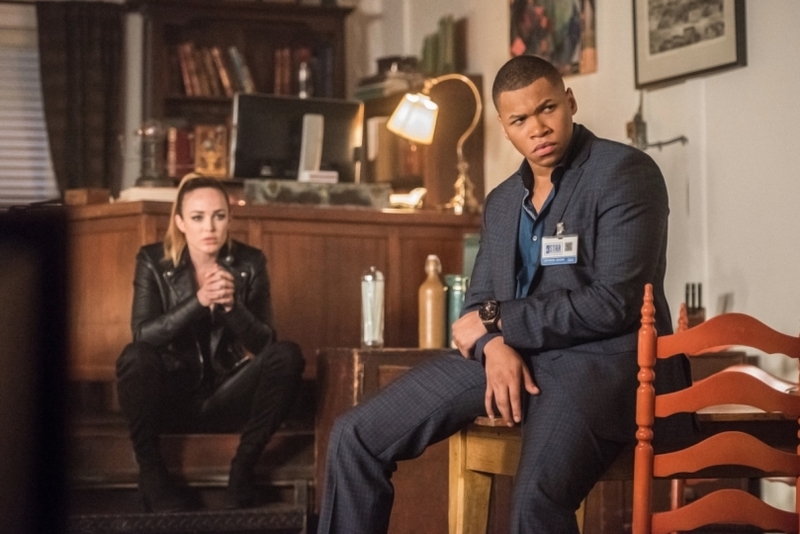 We automatically assume she’ll be saved in the second part of the finale next week, and for now what matters is, daaaaaamn, that Captain Cold is a sonofabitch. Amara’s likely temporary death capped off an insanely entertaining final confrontation in which the spear of destiny was passed around STAR Labs like a hot potato, ending up in the hands of one Legend or Legion of Doom member after another. The highlight had to be when Nate and Damien nearly high-fived while celebrating the former’s well-timed swing of the spear which launched Thawne across the room and knocked him out. It’s nice to see that for all their differences, the Legends and other members of the Legion can at least agree on how much they hate Thawne. Truly, the in-fighting and bitchiness among the Legion members has been one of the consistent highlights of the season. In “Doomworld,” it was actually the focus of the episode since it took so long for every Legend to have their memory restored, thus forcing us to make it through Brandon Routh’s poor attempt at dim-witted janitor speak. While that played itself out, there was much Legion bickering, which is always a good thing on this show. 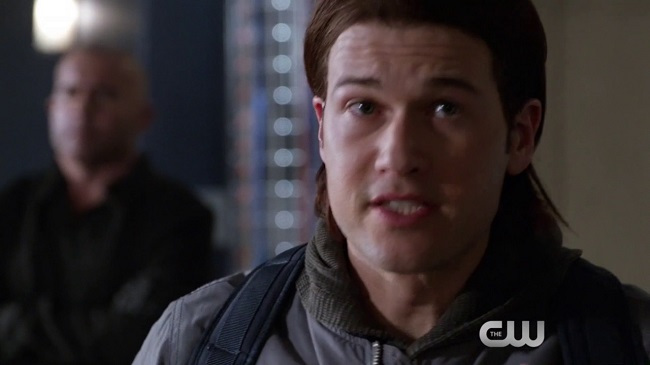 In this case, it afforded us such purely enjoyable moments as Malcolm and Snart criticizing Darhk’s self-indulgence bad guy speech which gave Sara enough time to not only escape certain death but also rescue Amara with her or Thawne lamenting that the Legends returning to thwart his plans was most annoying because it forced him to admit Malcolm was right. He was, after all, the only one who gave voice to the episode’s obvious plothole, specifically why didn’t they just erase the Legends from existence? Why keep them around to toy with them? However, seeing Thawne’s delight in pitting Jackson against Stein, or Darhk’s macabre joy in watching Sara snap Felicity’s neck was answer enough. As Margot Robbie’s Harley Quinn might put it, they’re bad guys. It’s no fun getting everything you want if you can’t keep your arch-nemeses around to taunt/torture them. Plus, it seems as if Mick and/or Snart might have lobbied to keep them around. I’m a little less clear, though, on why exactly Malcolm, Darhk and Snart were so intent on getting the spear back from Thawne. Everyone had been given everything they said they wanted. The explanation appears to be that sharing and trust was simply not in their nature, and as long as Thawne had the spear and the knowledge how to use it they were at risk of him suddenly erasing them from history. Fair enough. 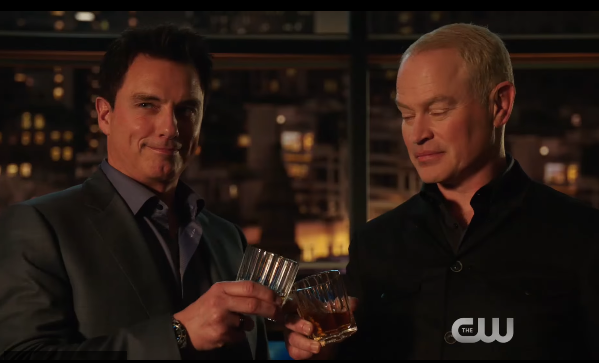 When it results in Nate and Darhk briefly celebrating Thawne’s injury before remembering they’re actually enemies it’s all worth it. I’m also not entirely clear on the time travel rules in play here. I love that the writers and producers are returning back to the show’s central premise and turning to time travel as the solution for next week’s finale, but they’ve now set up a possible negative outcome, which is time folding in on itself somehow if they interact with something they’ve already lived. However, wasn’t there that episode last season where they had to save their past selves? How is this different? They can interact with their own timeline, but not the timeline they’ve been living ever since becoming Legends? Also, doesn’t this mean that Legends and Arrow aren’t quite in sync right now because Arrow’s proceeding forward like everything’s normal even though everyone on the show is dead in the Legends timeline? That’s it. I’m out of here, slowly realizing how much I dread the season ending next week. I’m going to miss having new episodes of this crazy little show to enjoy, that is until whenever season 3 arrives. BTW, if you re-watch those earlier scenes in STAR Labs you’ll see the mini-Wavewider was there the entire time, hidden in plain sight. Many likely picked up on that, but I never did, meaning the reveal of Rip’s location at the end gave me one of the biggest laughs all season. Sidenote: So much was made on social media about Felicity’s cameo before the airing of this episode. Marc Guggenheim simply couldn’t resist spoiling it. I wish he had, though, because otherwise it would have been a nice little surprise. Either way, it’s not so much Felicity’s cameo as it is Felicity’s stunt double followed by maybe a minute of screen time for Emily Bett Rickards. Should the real Felicity ever don a costume I would consider this a successful test run because she looked fantastic in that suit, dead or alive.